I recently have been really into crock-pot cooking. I don't know if it's because it's fall or because I live in Colorado, but lately I've been obsessed. 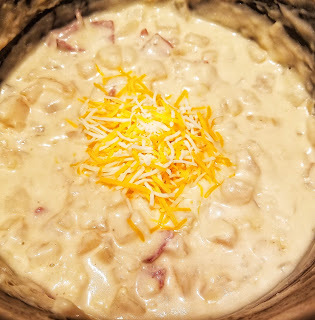 I have been making this potato soup recipe and I've decided to share with you all! You don't have to add in the turkey bacon or the vegetables but I find that it tastes best with all of them. You can add in any additional vegetables to your choosing. 1. Add in all your ingredients into the crock-pot. 2. Cook on high for about 3-4 hours or low 5-6 hours. Keep an eye on it because I made one batch and it came out like mashed potatoes (LOL!) and another batch where it needed more time to cook. 3. I sometimes top it off with a handful of shredded cheese just cause I love cheese.